Getting your hands on a brand new Android device comes with a world of joy. However, the blissful feeling is swiftly followed by the sheer resentment of having to transfer all your data to the new device. While cloud backup services from Google and Apple’s iCloud help ease the pain, you need an app to transfer your physical content to your new device. For all the new Samsung Galaxy S7 users or any Galaxy users for that matter, Samsung Galaxy Smart Switch app is the ultimate answer. 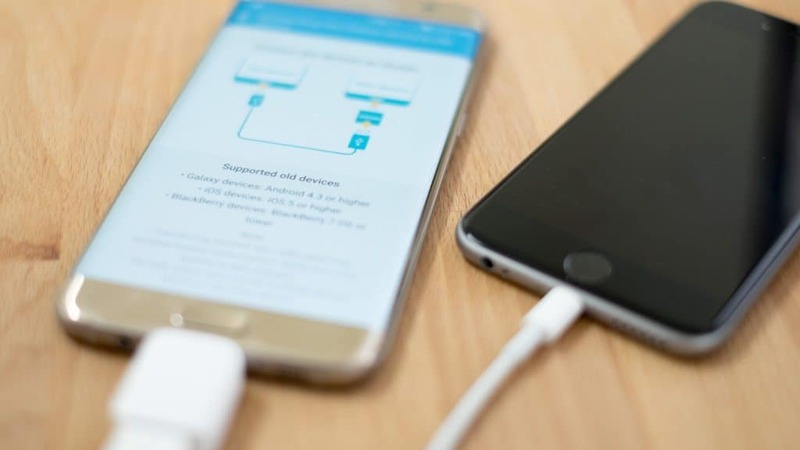 Samsung Galaxy S7 and Samsung Galaxy Note 5 even come with the Smart Switch adapter included with the box, so make sure you keep the USB adapter handy to transfer data to a Galaxy much faster. Start off by plugging in your Android, Blackberry, or iPhone to its charging cable and plug in the USB end of the cable into the Smart Switch adapter. Now plug in the Smart Switch adapter into your Samsung Galaxy device to begin the data transfer. USB transfer is compatible with old Samsung Galaxy devices running Android 4.3 and above, Blackberry OS 7 devices, and iOS 5 up devices. Once the Galaxy device recognizes the device that is connected to it, the transfer process will begin. iOS users need to “trust the computer” when prompted on the screen to begin the transfer, and must also disable iTunes data encryption if it is enabled. The Galaxy device will take a few minutes to gather the information present on the connected device. 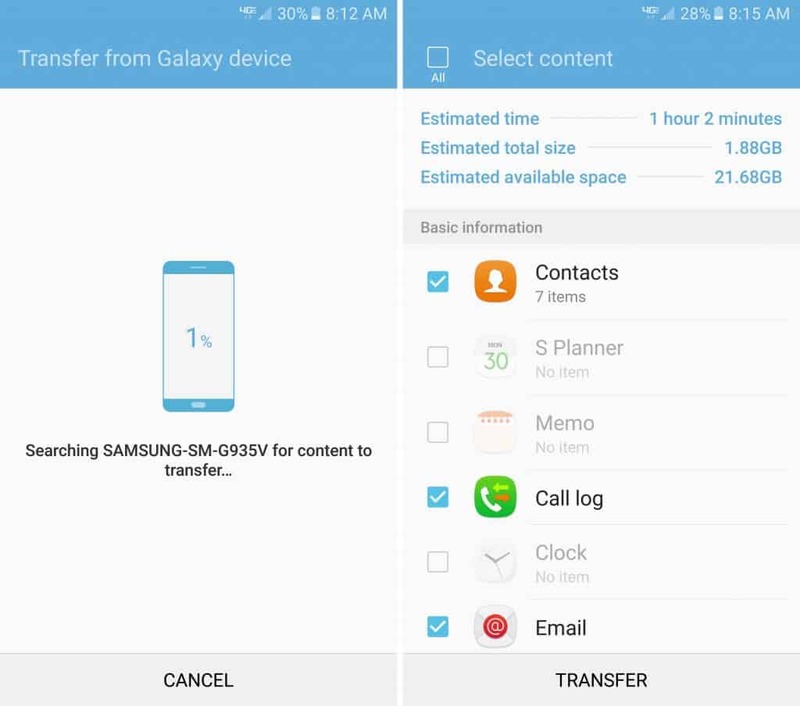 You will be prompted to select the items you want to transfer to your Galaxy device with Samsung Smart Switch. Tap on the check box next to items such as Contacts, Call Logs, Email, and then press “Transfer” to begin. Make sure you do not disconnect either of the devices until the transfer is complete. Just because you don’t have the fancy USB adapter, doesn’t mean you can’t make the best of Samsung Smart Switch. Start off by downloading the Samsung Smart Switch app for Android. Note: iOS users have the option to either use the USB adapter or iCloud to migrate from iOS to Samsung Galaxy. You can download the Smart Switch program for PC or Mac and follow the steps to transfer data from iTunes or iCloud to your new Samsung Galaxy. 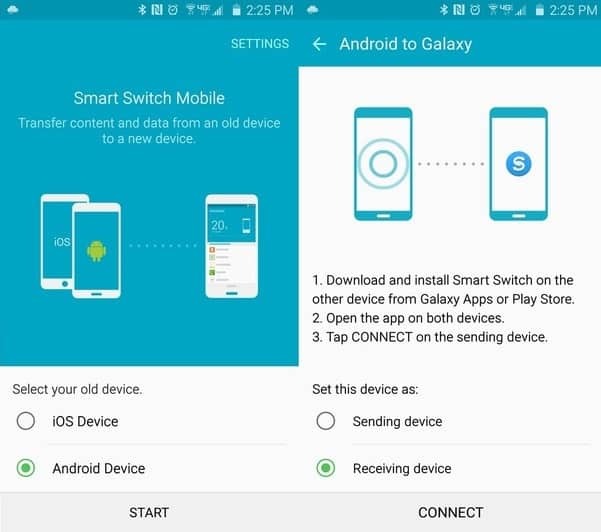 Open the Samsung Smart Switch app on the sender device, and then open the app on the receiver device so that they can establish a connection. Once the connection has been made, you will see a list of items such as Contacts, Music, Email, Memos, etc. which you can either select or exclude from being transferred. Depending on the amount of content you are transferring between the two devices, you should be greeted by a page saying “The transfer is complete. This process is far simpler if both your devices are Samsung since all your data can be transferred with the Smart Switch app in minutes. 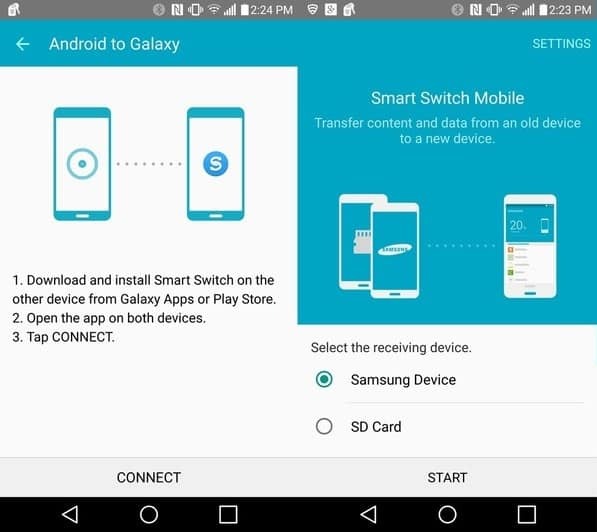 Will you be using Samsung Smart Switch for your next device transfer, or do you still prefer your good old cloud storage apps to get the job done? Let us know your opinion in the comments section below.